Boy are you in for a great treat today! I’ve partnered with some friends and At Home to bring you Fall Home Tours inspired by #myreason to decorate for the season. Fall is one of those seasons that seems to bring such excitement. There is a pumpkin spice, cable knit sweater, and spiced apple cider frenzy that only this season can bring. 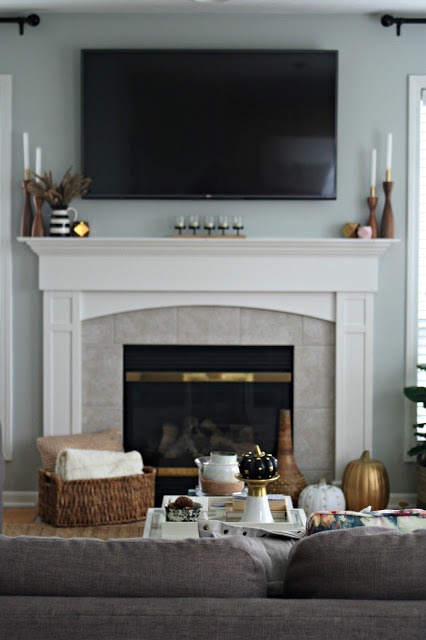 I don’t know about you but the cooler temperatures have me wanting to make our interiors nice and cozy to settle in for family movies around the fire. So, grab your pumpkin spiced latte and come along to be inspired with perhaps one too many pictures. I went a little camera happy. A huge welcome to those visiting from the other bloggers in this fall tour hop! Hi and thanks for coming by! 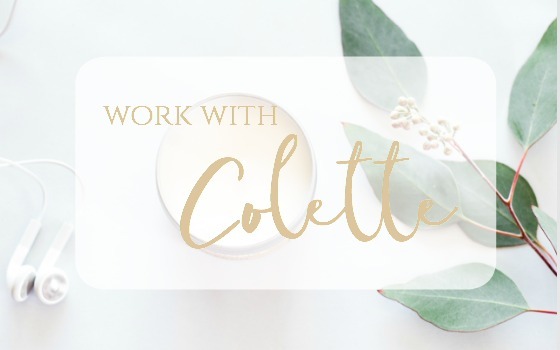 I’m Colette – A DIY girl at heart who loves gold, glam, and everything in between. 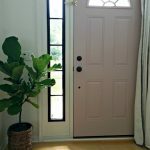 We are slowly transforming our cookie cutter home one project at a time into something fantastic and unique. Cozy layers, warm mixed metal, wood tones, and pops of blush and black is my fall formula for success! 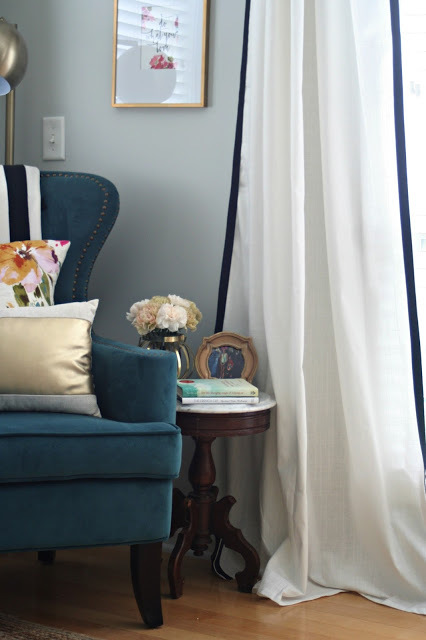 In the living room I switched out our pillows with these velvet gold studded ones that instantly added warmth with a hint of glam. 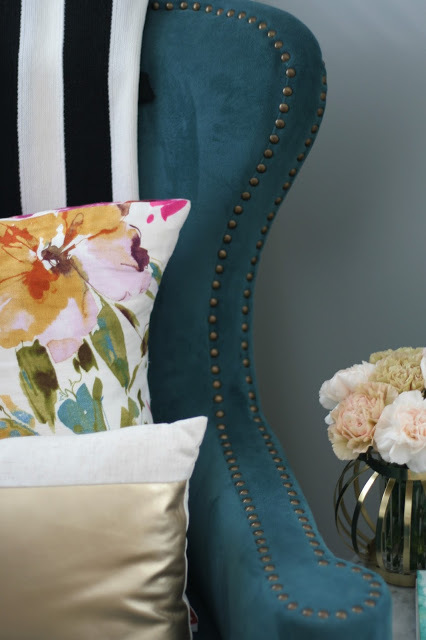 The muted pastel floral pillows carry the color palette of the space all in one little spot. I LOVE them. I love to switch out the pillows on our teal chair to keep the room looking fresh. This linen and gold leather pillow was such a fantastic At Home find! 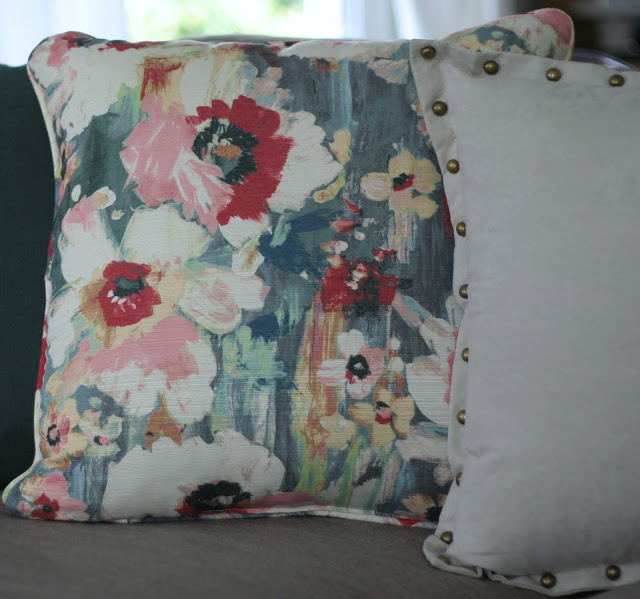 The masculinity of the leather is such a fun play with the feminine floral pillow. 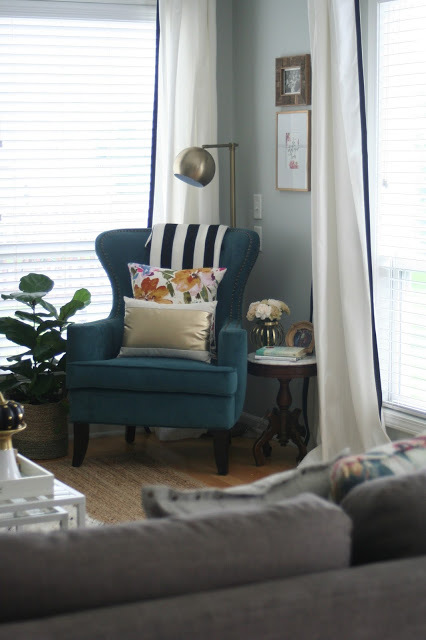 The black and white striped throw is unexpected and funky. 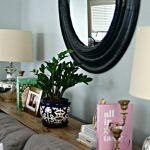 The fiddle leaf fig was a Home Depot find that just jumped in my cart for $10! I had a basket on hand and placed her in it which cozied that corner right up. I picked up these pumpkins from At Home and gussied them up! They were your average orange pumpkin but I gave them a quick coat of spray paint and added some gold thumb tacks to add a little personality. 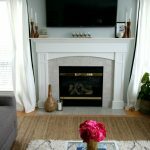 I loved their shape and size and knew they’d be perfect by the fireplace. 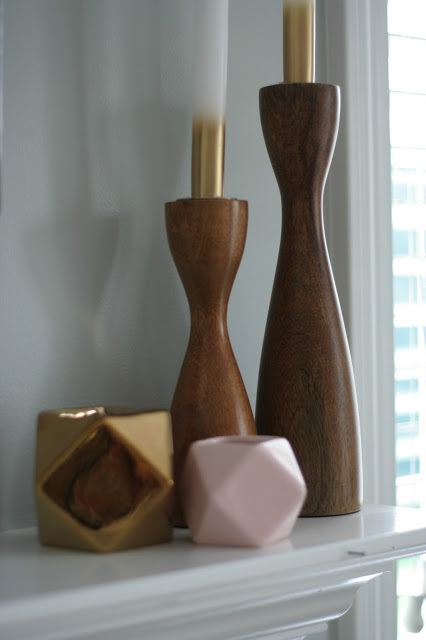 The tall wood/gold vase was a Home Goods find that really added some warmth. The mantle of course needed some fall touches. I kept the candle sticks and vase because they were perfect for my fall color palette. 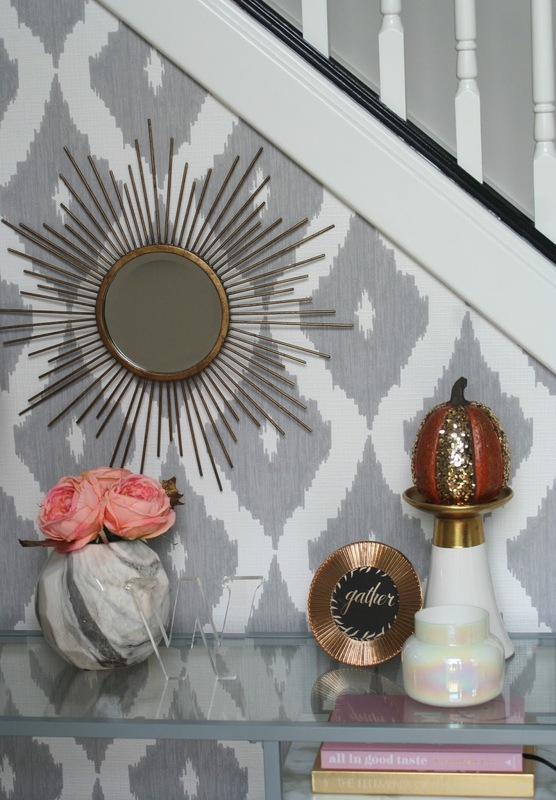 The geometric gold and blush vases were an At Home find that added color and dimension. I loved their fun shape and how inexpensive they were! 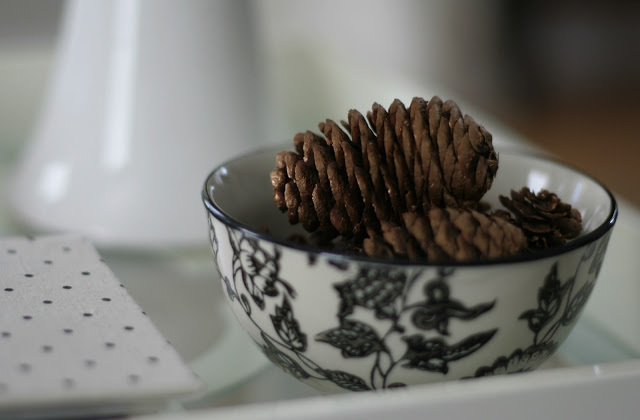 They can easily fit in with any season and decor style. I added in some faux florals to the vase in a more muted color. A clearance Anthropologie candle holder was converted to a vase for these gorgeous gold and blush carnations I picked up at a local grocery store. There is so much yumminess in this one picture I can’t even handle it. That gold leather pillow is perfection. 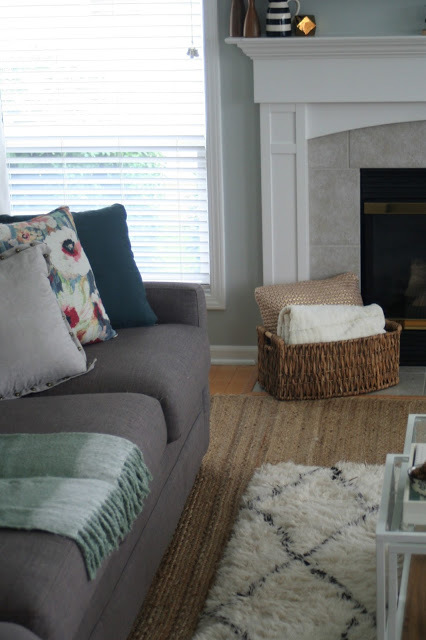 What doesn’t say fall like a basket filled with pillows and cozy throws? 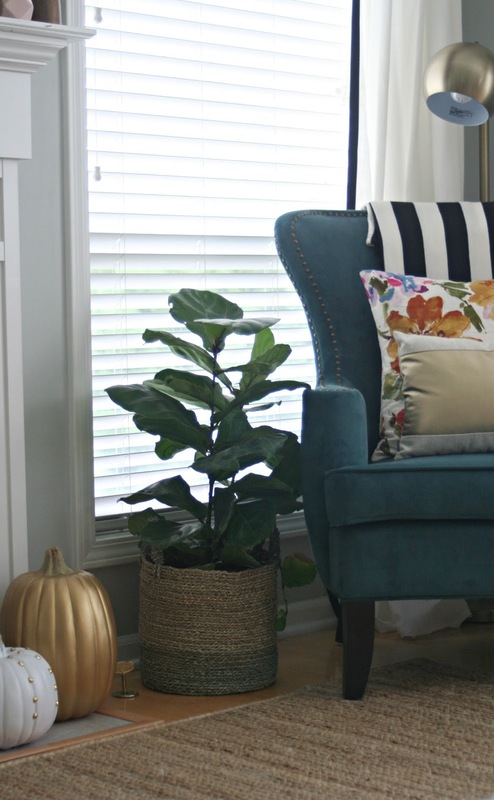 I grabbed this super cute basket from At Home along with the throw and gold/blush pillow to make an easy one stop shop for cuddles on the couch. I know it makes me want to curl up and snuggle the kiddos. 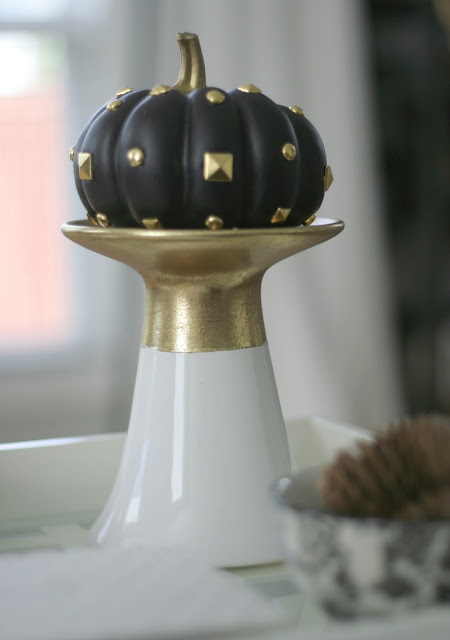 This gold/white pedastal makes the perfect spot for this rebel pumpkin. Spike studded black pumpkin you say? Count me in! It deserves to be on that pedestal. I added some simple decor to our kitchen table. Let’s be honest, this is a drop zone for all. the. things. Kids homework, laptops, snacks…it’s a lived in kinda area. Yup, there is a bit of orange and red there. I caved in a bit haha. 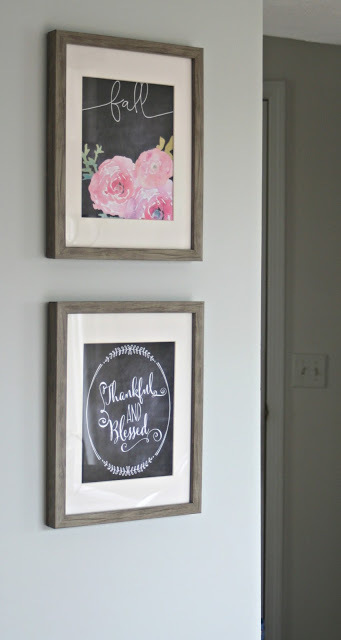 I picked up these sweet frames from At Home for our kitchen wall to fill with some seasonal printables. 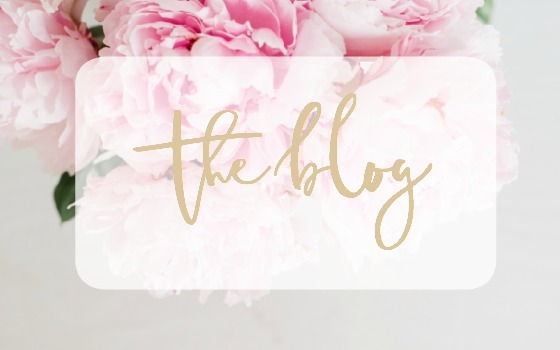 I created the one on top and found the ‘Thankful and Blessed’ printable here. 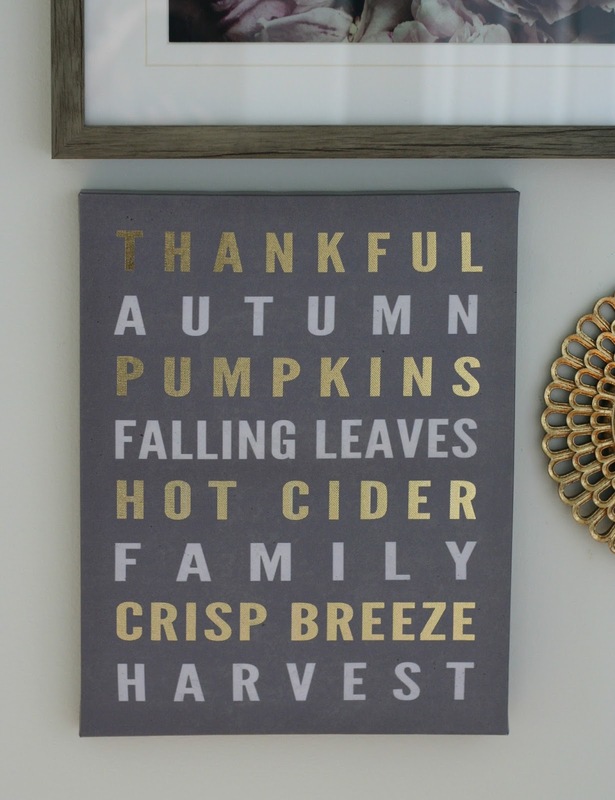 I’m sharing with you the Fall printable I created here so you can download one for yourself! Let’s move to my favorite part of the house…our entry wall! 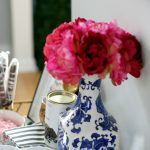 My favorite pieces on this entry table are the marble style vase and the gold and white pedestal, sister to the one holding the rebel pumpkin. 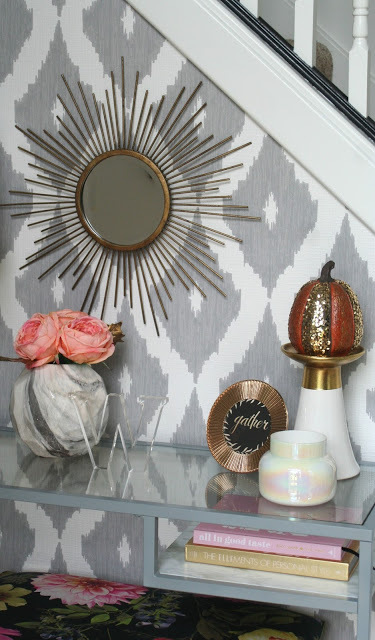 I filled the marble vase with some faux florals and gold leaves and it looks stunning next to the wallpaper wall. I had the gold glittered pumpkin in my holiday stash and it was begging to come out of storage even though it was orange. I switched out our family picture in the frame for a printable I found on Oh So Lovely Blog. 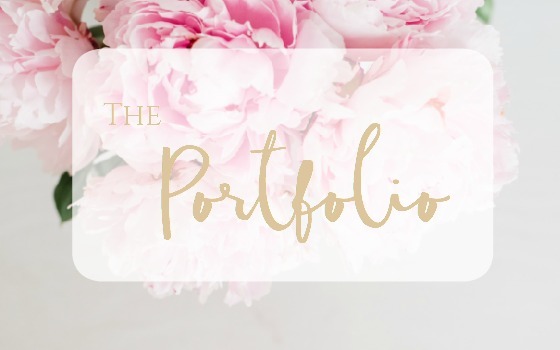 If you haven’t checked out her blog you should…she has tons of great free printables. 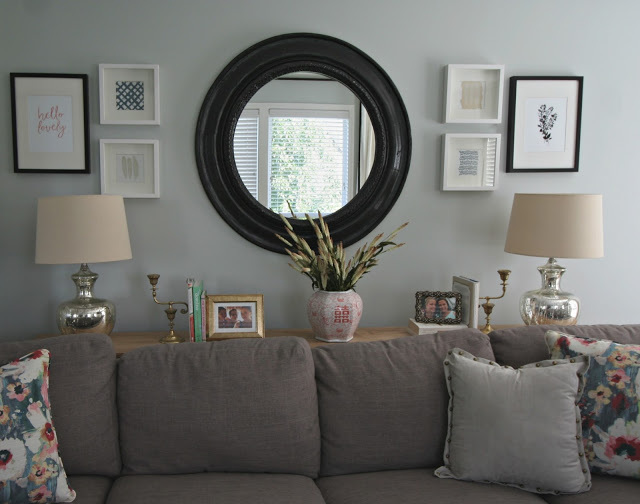 The sunburst mirror was also from At Home during our Summer Refresh. I switched out our ice cream art print for this subway style canvas that was too fun to pass up! 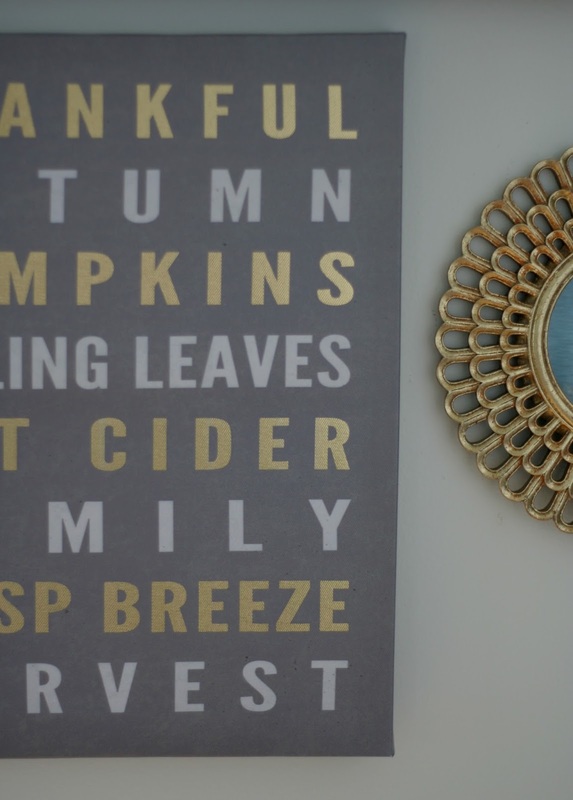 Our front door is looking fantastic all spruced up with our DIY Gold Hoop Wreath. 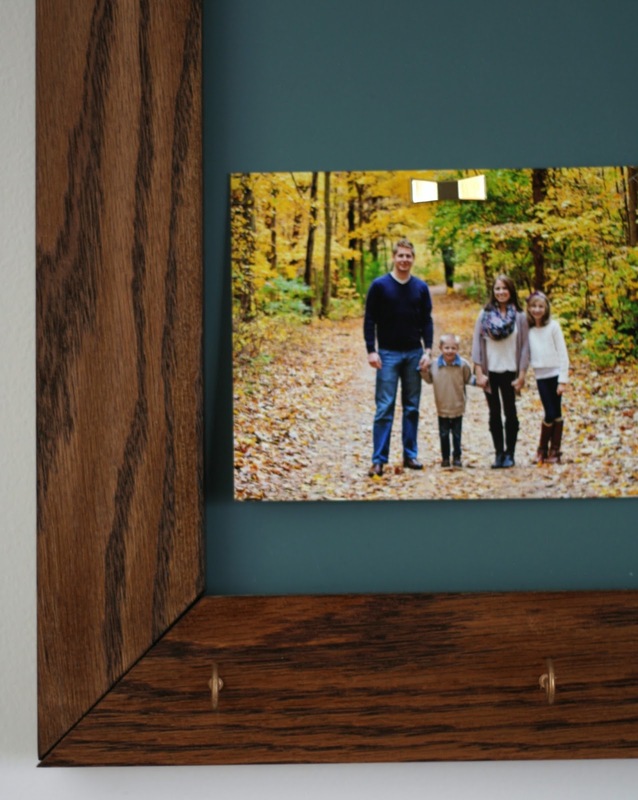 I also added in some of our favorite Fall family pictures throughout the house that bring me so much joy. Isn’t that what decorating and creating a home is all about? 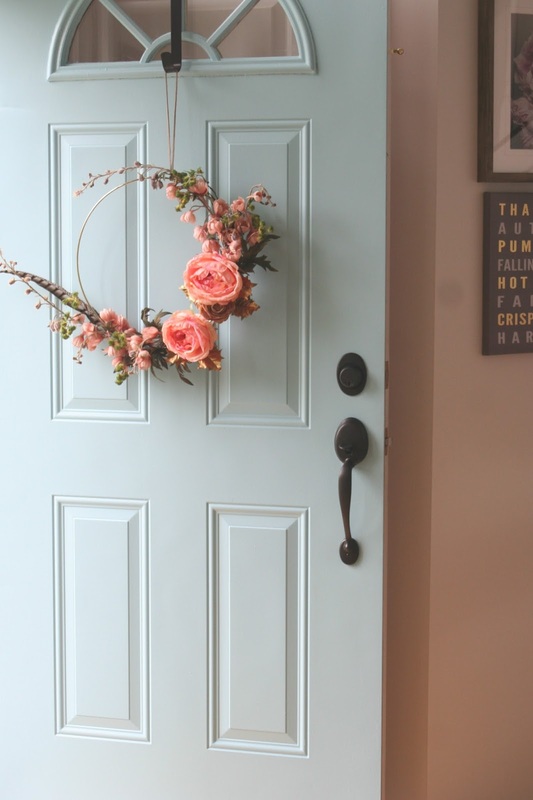 Creating a home is about filling your space with family and friends, making memories for your kids, and surrounding yourself with things that bring you joy. 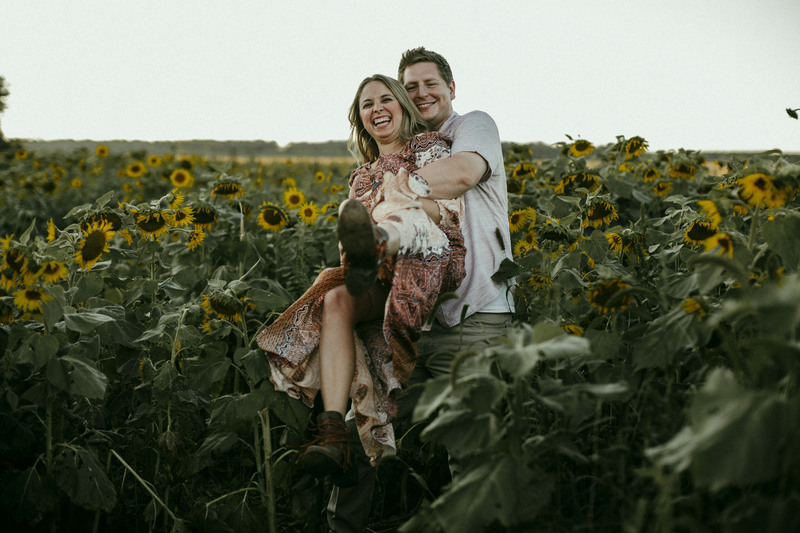 Maybe it’s a picture of your family from the happiest place on earth (Disney of course), or a beautiful pillow, or a basket of blankets that makes everyone want to curl up on the couch together that bring you joy…whatever it is take the time to enjoy your space and make it your own. There are no rules to how you make a home just to simply live and enjoy the company around you. That is #myreason to decorate for the season. I’m so thankful for the opportunity to share this home with family and with you guys! I’m inspired by you all and I hope you feel inspired to challenge the norm and perhaps buy a black studded pumpkin or a gold leather pillow to fun things up a bit. I still have my updated fall front porch to share so stay tuned for that. HUGE thank you to the kind folks from At Home for sponsoring our fall tour. At Home has a warehouse of home decor items that would be sure to fit any budget and style. I’d have to say their pillow and mirror selection is my favorite area of the store…but I also admittedly have a problem with wanting to buy them all. How do you get ready for the season? 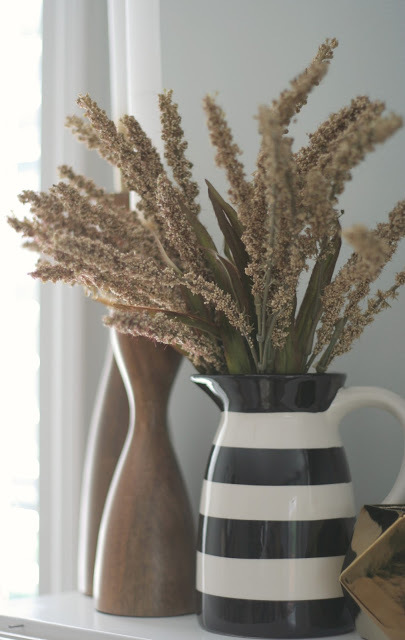 Do you stick with traditional seasonal colors? Be sure to check out the other fantastic homes in this fall tour! Your home is so beautiful!! 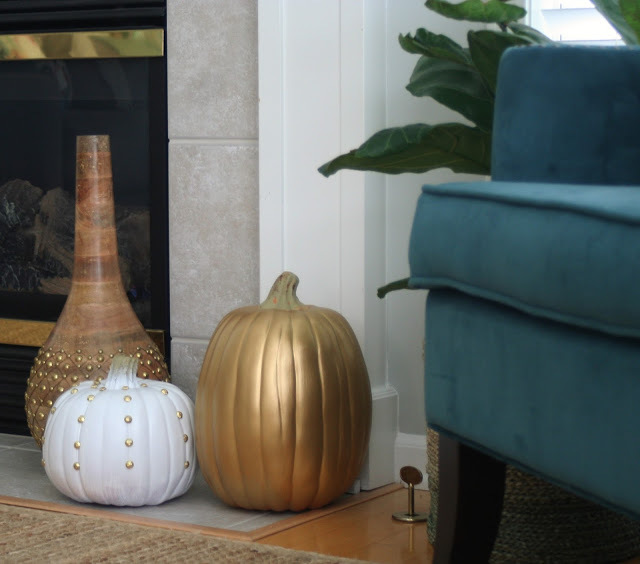 I love all the pops of gold, especially those gussied up pumpkins by the fireplace. Love the accent pillows, too! 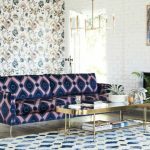 I SO agree about why you decorate your home and I think that's the beauty in home decor – it's completely able to be unique to everyone! You did a fantastic job making blush and gold scream FALL! I love it! And that wreath you did on your front door?! How beautiful! 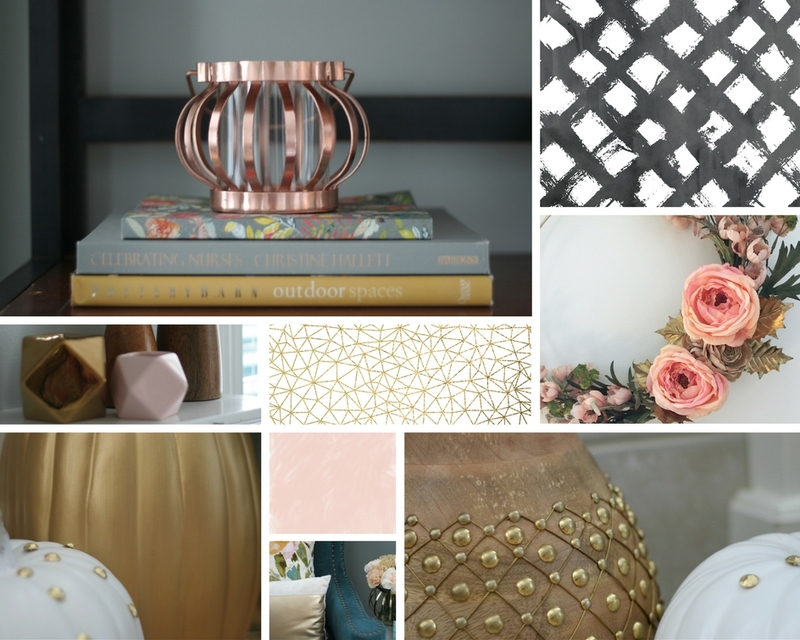 I love your fall glam touches of blush and gold. I, too, love a little glam when I'm decorating. 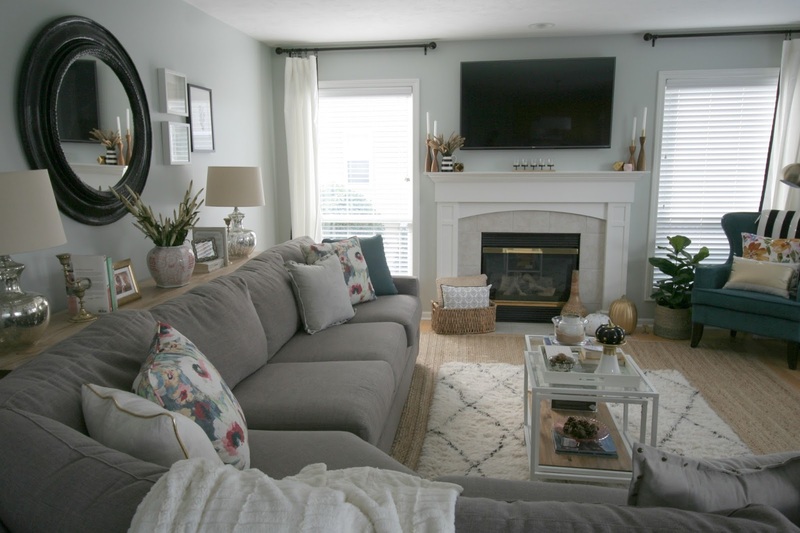 Your pillows are beautiful and your fireplace decor is so cozy and inviting. It's all gorgeous! 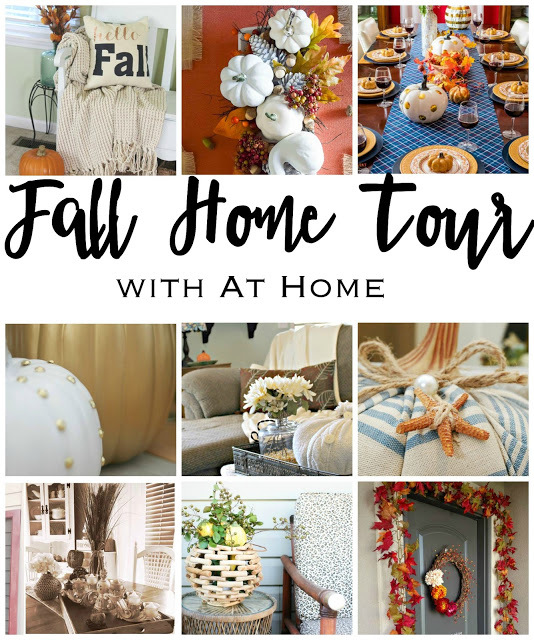 This is such a fun home tour with so many unique and beautiful ways to decorate for fall. I was tempted to grab that marble vase too! Gorgeous! Great pillow choices and those candlesticks are so stylish. I love your beautiful hone! That gold rim around your fireplace is beautiful!!! I love your twist on the seasonal. I agree that your home should suit the needs of your family. Love the pumpkins and your note about the spikey one! !Everything looks so lovely!! 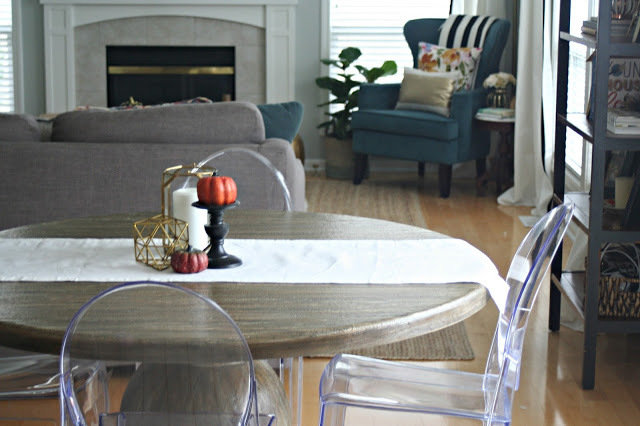 I love your choice of non-traditional color scheme I never thought of glam for fall It looks fabulous…. and painting orange pumkins gold? Brilliant!